I initially came up with idea of using a lottery system in your class as a universal, Tier 1 support for PBIS one year ago this week, but never felt the "need" to implement it until this semester. I got to a point where I felt like I had a handful of students negatively influencing a large percentage of my class to act out in ways that they did not usually exhibit in one-to-one interactions with me. 1. Kids should not have to be rewarded for good behavior. 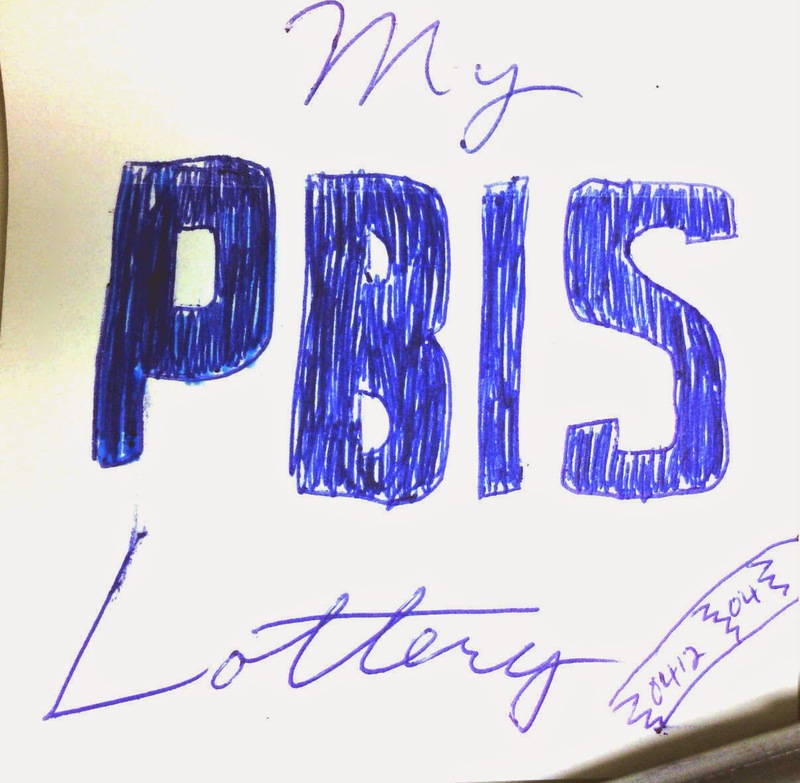 While I probably still believe that's true, my PBIS lottery system (to me at least) was far less about the reward and much more about being able to catch students doing good. It changes my attitude toward my students when I'm walking around the classroom looking for opportunities to hand out a ticket, than when I'm patrolling for off-task things to come down on. I, the TEACHER, feels better about my class as a whole on the days I give out more tickets, and I think the STUDENTS feel better about their relationship to me. 2. I don't want to spend a ton of money on this. I had a mixture of monetary and privilege rewards. Over the 6 or 7 weeks I ran the lottery this semester, I think I ended up spending less than 15 dollars on candy that I bought at the dollar store. On "normal" weeks (the weeks I remembered to do the drawing on Friday and/or I felt like I had passed out a "fair" amount of tickets), I gave out ONE $1 candy bar/box of candy between all of my students. There were 2 Fridays in which I gave out a box in each of my hours because I had missed one (or two) lottery drawings on previous Fridays. Buying it all at once sort of felt like a lot because I have a general policy of never buying treats for my students, but spread out over the entire semester, it was money well spent. Privilege rewards started as one kid per classing winning the right to listen to music on their headphones all week (which is, sort of (?) against the rules in our building, but worth the trouble it may have cost me for ONE kid in the room). After the first week, I added in privileges that made the tickets work more like class "money," which I'll discuss in the next bullet. 3. Kids aren't going to care about a small chance at candy. For some kids, this did end up being true, for a couple of reasons. I had some students that I think legitimately valued me noticing them more than they valued candy. They didn't increase their positive behaviors because they wanted candy - they increased because they wanted me to notice. Those kids were a total win for this. For the other set of kids, after the first week, I added in the right to a hallpass, or a brand new pen/pencil for any kid that needed one for the price of one ticket. This actually made the tickets much more valuable, and solved a huge problem for me that I don't like NOT allowing kids to have the freedom to use the restroom, but had set up an environment for myself in which I was making the decision for a kid dozens of times a day. For my own sanity and free cognitive capacity to actually TEACH, I let any kid go (during an appropriate point in the lesson) if they had a ticket. 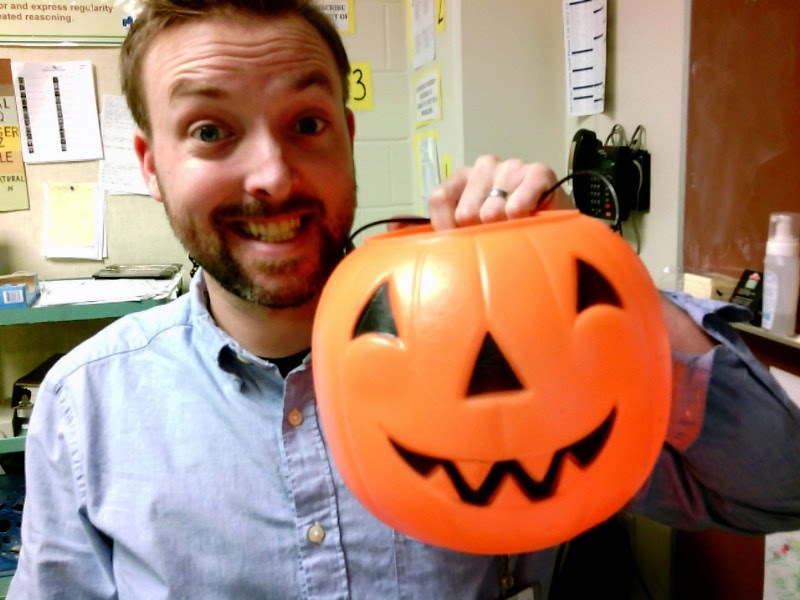 So, should YOU try out a classroom lottery? Yes, yes, you definitely should. There were several kids that I think the lottery ended up saving our relationship this semester from being terrible to at least civil, but more so, for the change in ME that I felt/experienced. I felt a lot of joy being able to reward the behaviors/actions I was trying to encourage without feeling like I was taking money from my family or giving away too much of myself emotionally. I noticed a difference in my attitude toward my students even period to period if I forgot to have my tickets ready for one of my classes. (As some of my students pointed out on my end of semester survey), it really gets under my skin some days when my level of care for my students' learning/character was much higher than their own. While I can hope that eventually those problems will iron out with wisdom and/or maturity, even if they never do, I can control MY attitude, and on many days, this lottery was the tool that got me through the hour with my sanity. You can export from Canva as a PDF or PNG - the PDF version of this page provided a MUCH nicer product. The PNG wound up with a lot of pixelation. To keep kids from potentially photocopying the tickets, after I printed a sheet, I numbered them by hand in series. A couple times I forgot what number I had left off on - that didn't really matter so much as that they were numbered at all. The two times I had no idea what number I was on, I just started at the next whole hundred. (I left off somewhere in 04**, but couldn't remember exactly, so the next time, I just started at 0500). This is how they ended up looking when passed out. For the drawings, I used a random Halloween bucket that a teacher had left in the back of my room at some point in the past. It wasn't secure, so I had to just take the tickets immediately before the drawing, but it was good for getting your hand in their and shuffling the tickets. I definitely plan to continue my lottery during summer school this year, although I may have to increase the frequency of drawings since the whole "term" is only 2 weeks for one of my classes. 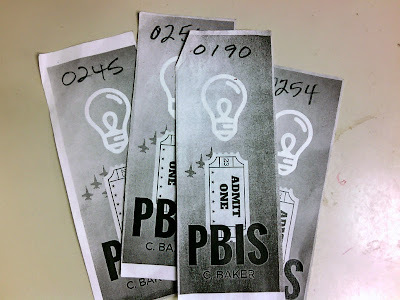 The most PBIS-y component of lottery that was missing was that I never posted an official list of positive things students could do to earn tickets. Most students picked up on the implicit messages of "Do your work," "Volunteer for something," "have your scientific calculator," and "ask a good question," but posting a list was something that I know I SHOULD do, but never got around to. Its a matter of equity in knowing the classroom procedures.